"What a hoot to shoot!" "I hate that thing! I hate that thing! Let's Shoot it again!" "That thing is just pure evil!" These are a few of the comments from shooters who have shot the Shooting Star component of our target system. The Shooting Star is a perfectly balanced 5 arm or 6 arm star. Each arm of the star accepts the standard A-36 or AR-500 Ballistic steel targets. The star is precision cut from 3/8" thick A-36 plate and can withstand pistol rounds for many years. If you want to shoot rifles at the plates, the arm of the star can accept optional protector plates made from AR-500 Steel. 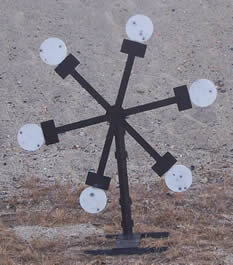 The standard plates can be shot with any caliber from 22 rimfire in a rifle to 45 ACP in a pistol. The AR-500 Ballistic plates can be shot with most rifle calibers at a distance of 100 yards or more. It means that if you are going to only use pistols than the A-36 plates are what you want. However, if you decide to shoot rifles at the plates and need the extra strength of the AR-500 steel then follow the link below to see pictures of an 8" AR-500 plate shot at 100 yards with a 30-06 FMJ Mil. Surplus, .308 FMJ Mil. Surplus, a .308 Match round and a .223 Rem. FMJ round.